The Skilless Horseman | Redeemed! | Redeemed! I am not a horseman. Now, any of you who visit my personal Facebook page know that I spend a fair amount of time around horses. We own several horses, and I put a good deal of time and effort into caring for them. We recently bought a little horse for the sole purpose of having him available for our grandkids to ride. I ride with my family at every opportunity. I spend a couple of Saturdays each month watching my 12-year-old ride in rodeos. My wife grew up around horses, and rode in rodeos throughout high school and college. Likewise, her kids (my step-sons) have grown up around horses and rodeos. 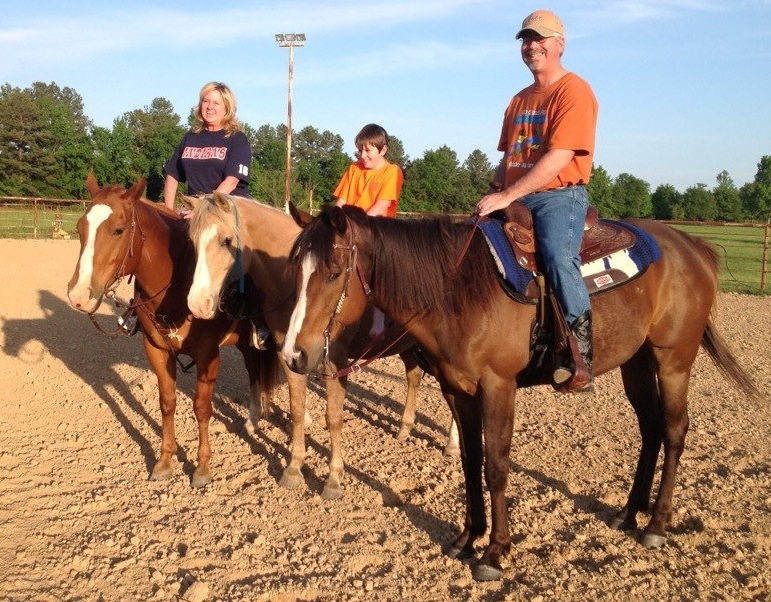 For us, horseback riding and rodeos are a family pastime. Anyone reading my Facebook posts, looking through my pictures, or listening as I talk about family activities, might get the impression that I’m a horseman. That would be a false impression. Yes, I like horses, I like riding, and I love spending time doing horse events with my family. BUT…I am not a horseman. Unlike my wife, I did not grow up around horses. I did a little bit of riding on friends’ horses…enough to think I knew a little about them…but I didn’t. The more time I spend around horses and rodeos the more I realize just how little I know. These kids who grew up riding have more knowledge and skill at 10 years old than I’ll ever have. It’s a funny thing, though. Over the last couple of years, my riding has improved a bit. I still don’t know much, but I know more than I did. I don’t bounce around in the saddle as much. I don’t hang onto the saddle horn. I know a bit more about how to handle a horse that acts up. Overall, I’m less tense and more comfortable around horses, both in the saddle and out. The same experiences that have shown me how little I know about horseback riding have also resulted in my knowing more than I did and in looking just a little bit more like a horseman than I used to. Like many aspects of life, the more I learn the more I realize how much I don’t know. And I find myself pondering…isn’t that what living authentically is really all about? Living authentically, as a Christian, doesn’t mean I refuse to engage in Christian activities until I’ve first perfected the Christian life. That would be as silly as refusing to ride a horse until I first perfected riding! One cannot improve without practice. Just as one cannot become a horseman without riding, one cannot become Christlike without imitating Christ. A hypocrite is a hypocrite, not because he falls short of his goals or is still learning. Hypocrisy is born when we start trying to fool people into thinking we’re something we’re not. If I went around pretending I knew as much about horses as anyone else, and bragging about what a great horseman I was, I would be a hypocrite. When I thought I knew more about horses than I really did, I was a bit of a hypocrite, simply out of ignorance. Now that I know enough to freely declare I’m not a horseman, I’m no longer being hypocritical. In the same way, when we start thinking we have God all figured out, and act as though we have all the nice pat answers to everyone’s life problems, we’re being hypocritical. To live authentically and avoid hypocrisy, we must always remember that the more we learn the more we realize how little we know. Therefore if you have been raised up with Christ, keep seeking the things above, where Christ is, seated at the right hand of God. Set your mind on the things above, not on the things that are on earth.For you have died and your life is hidden with Christ in God. This entry was posted in Authenticity, Faith, Horses and tagged authenticity, biblical, christian, covenant, faith, grace, horses, living, ministry, truth by joe. Bookmark the permalink.